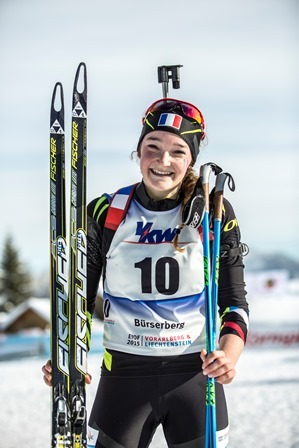 France were the biggest winners on day three of the European Youth Olympic Festival (EYOF) in Vorarlberg and Liechtenstein, adding three gold medals to their tally. 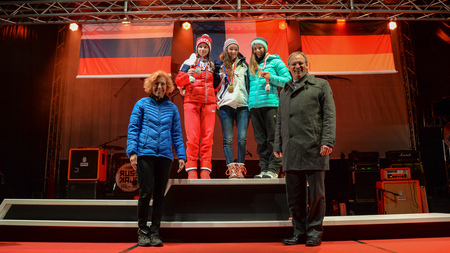 Romane Geraci won the girls' Alpine skiing giant slalom event in Malbun, while Lou Jeanmonnot prevailed in the girls' biathlon 7.5 kilometres pursuit in Bürserberg, and duo Manon Petit and Merlin Surget came out on top in the snowboard boardercross mixed final in Schruns. 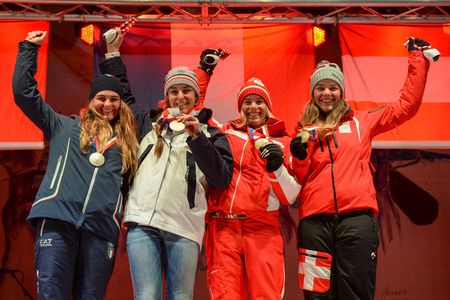 Geraci posted a combined time of 1min 49.20sec to finish 0.33 seconds ahead of Italy's Laura Pirovano and a further 0.45 clear of joint bronze medallists, Austria's Katharina Liensberger and Switzerland's Melanie Meillard. "I really felt a lot of pressure after the first run when I was in the lead," said Geraci. "I am happy that I've stayed cool and won this medal. "It means a lot to me, because the EYOF is just one single event and I am proud having been able to show my best performance exactly in this very moment." A time of 27:17.90 proved to enough for Jeanmonnot, with Russia's Vera Rumyantseva taking the silver medal in 27:30.60 and Germany's Sophia Schneider completing the podium in 28:01.20. "The race was really tight," said Jeanmonnot. "I didn't expect to win. As for Petit and Surget, they saw off the challenge of second-placed Austrians Pia Zerkhold and Andreas Kroh, and third-placed Swiss pairing Sophie Hediger and Pascal Bitschnau in the final. 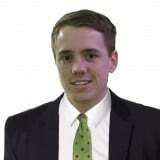 "It's a very special team event," said Surget, winner of a gold medal in the boys' competition on Monday (January 26). "The course was fast and perfectly set. "The main thing was to stay on board." The third day of competition was also a productive one for Germany in Steg as cross-country free technique skiers Janosch Brugger and Antonia Fräbel triumphed in the boys' 7.5km and girls' 5km respectively with times of 19:06.00 and 13:46.10. "I am really pleased," said Fräbel. "I didn't expect such a great result because I had troubles breathing correctly." Russia won the silver medal in both events, with Egor Kazarinov coming second to Brugger in 19:18.90 and Olga Kucheruk losing out to Fräbel in 14:01.10, and there was also a bronze medal for the Eastern European nation as Polina Nekrasova completed the girls' podium in 14:03.60. Norway's Petter Stakston earned the boys' bronze medal in 19:29.90 to add to the gold he won in the 10km cross-country race on the opening day of competition. There was success for co-hosting nation Austria in the boys' Nordic combined relay, as the quartet of Daniel Rieder, Philipp Kuttin, Samuel Mraz and Mika Vermeulen clocked an overall time of 56:37.30 to finish ahead of silver medallists Germany and bronze medallists France, despite ranking sixth in the ski jumping element in Tschagguns. The German team - made up of Constantin Schnurr, Benedikt Schwaiger, Tim Kopp and Willi Hengelhaupt - were 3.3 seconds off the pace, with the French foursome - comprising Yann Laheurte, Brice Ottonello, Lilian Vaxelaire and Theo Rochat - 1:13.40 behind the gold medallists. "The cross-country race was great," said Kuttin after helping guide his team to victory in Gaschurn. "It was the right decision to immediately catch up. "We had very little expectations before the race." Meanwhile in the boys' HS 108 ski jumping team event in Tschagguns, Slovenia's team - Tine Bogataj, Bor Pavlovcic, Urban Rogelj and Domen Prevc - recorded a total of 1,030.40 points to claim the gold medal. Finland - Andreas Alamommo, Niko Loeytaeinen, Joni Markkanen and Niko Kytoesaho - came second with 1,000.70, while Austria - Julian Wienerroither, Michael Falkensteiner, Max Schmalnauer and Clemens Leitner - were third on 953.80. "It's a great feeling - the whole team is really happy," said Bogataj. "I only finished eighth in the individual competition. "That's why it's so amazing for me to be on the top podium today." Elsewhere, the boys' and girls' figure skating free programmes took place today in Dornbirn, following on from the short programmes held on Monday. Ukraine's Ivan Pavlov scored a winning total of 130.51 points to finish ahead of Latvia's Deniss Vasiljevs on 127.62 and Russia's Dmitry Aliev on 121.82 in the boys' competition, while Russia's Alexandra Proklova registered 152.86 to stave off the challenge of Germany's Lea Johanna Dastich on 142.24 and France's Lea Serna on 131.20 in the girls' competition. Sebastian Samuelsson of Sweden claimed the boys' biathlon 10km pursuit gold medal in Bürserberg with a time of 31:45.20. Norway's Sturla Holm Laegereid and Aleksander Fjeld Andersen were the silver and bronze medallists, coming through in 31:50.80 and 32:30.80 respectively. In the ice hockey competition, Austria were thrashed 10-1 by Finland, after the Czech Republic had beaten Slovakia 3-1. After three days of competition, Germany and France top the gold medal rankings with four each, while Russia and Austria have three apiece. The action is due to continue tomorrow with ice hockey, cross-country skiing, Alpine skiing, ski jumping and snowboard all featuring on the programme.